Ok, so since I got a little bit of interest from readers to see more in-depth how I did Little Man’s Busy Book I decided to give you some more details, 2 pages at a time. Here are the first two pages, the window and the squirrel. I made stencils for almost all of these pages, the same way I do for the appliques on clothing. 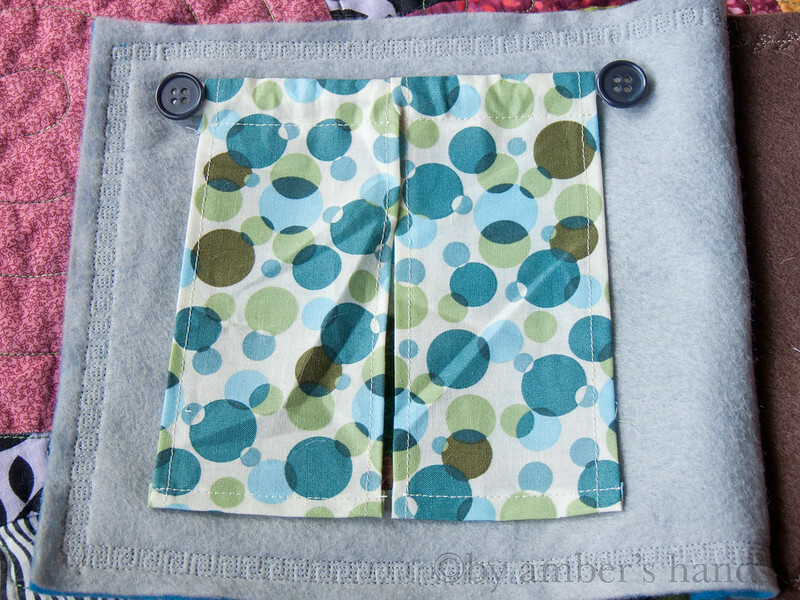 I also used a sewing machine for most everything, but it’s possible to do this without one. It will just take a lot more time. Let’s start with the window, shall we? I picked a size square for the window that I thought looked good on the page. I think it’s about 5 inches. I made a square stencil and then cut out the center of it so there would be about 1/2 inch frame. One of the key fabrics I used in several places in this project is a wood-like pattern. I used that for the window frame. 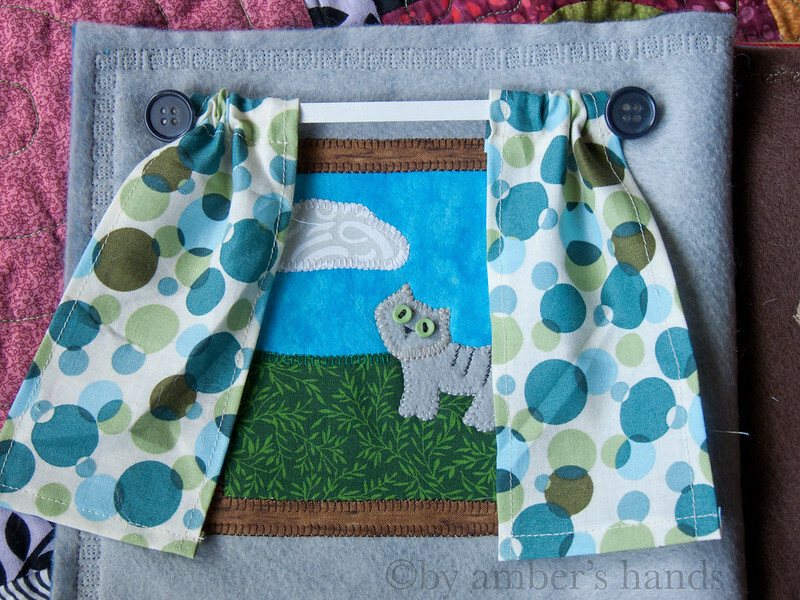 I cut the fabric for the grass & the sky so that they overlapped each other and the window frame so no raw edges would show. Almost all fabrics used in this project were adhered first with Heat’n Bond before being stitched. So I first ironed the sky, then the grass, then the kitty & cloud, then the window frame. Then I used an embroidery stitch on my sewing machine to sew everything down. 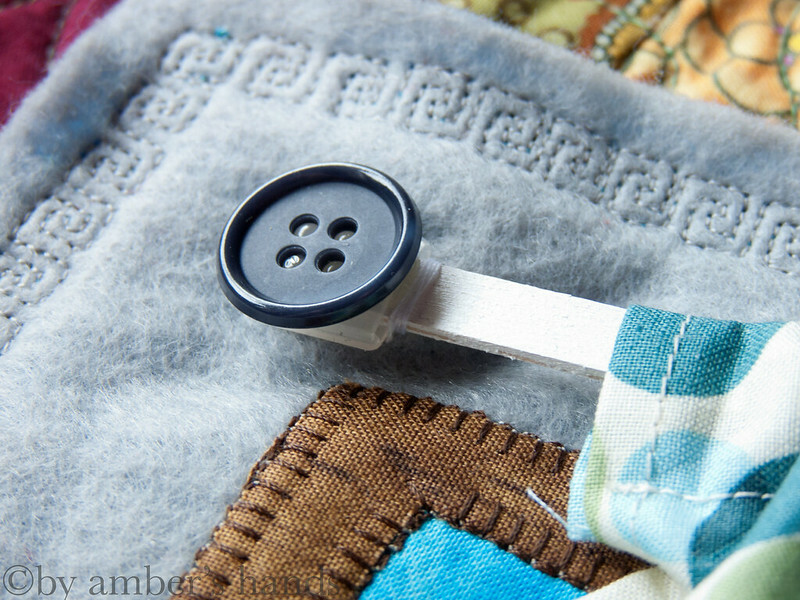 I used the blanket stitch, as I find that works best on raw edges. Once everything is ironed down, it doesn’t matter a whole lot what order you sew things down for the most part. For smaller pieces like the cat, I adjusted my stitch so it would be smaller. See how the slightly different color around the kitty’s head makes it stand out from the rest of it? I totally did that on purpose. Certainly nothing like I have poor lighting in my dining room where I was sewing and therefore grabbed the wrong thread. Totally on purpose. Yup. 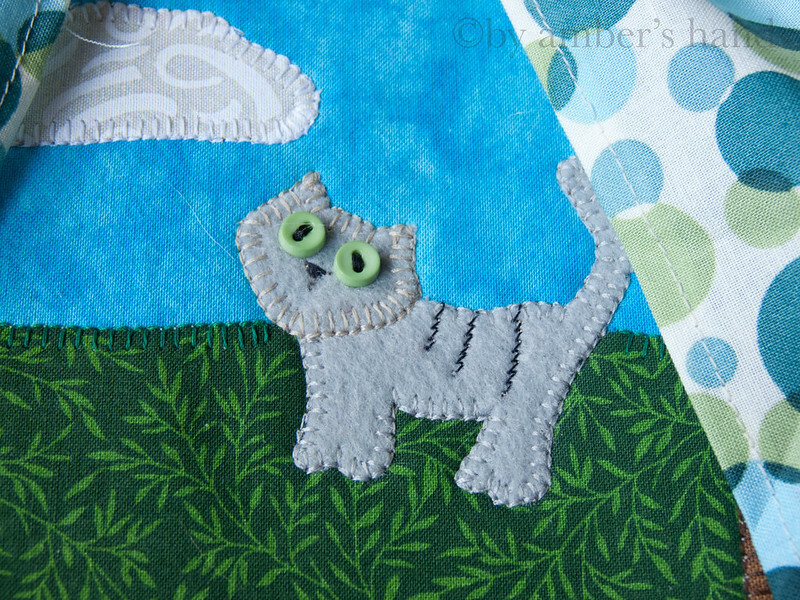 I used black thread and a zig-zag stitch to put stripes on the cat, and a different embroidery stitch to make the nose. I wasn’t sure what to do with the eyes. I had planned on using black buttons, but it looked really odd. When I first put the green buttons on the face, I was still unsure. Then I realized with black thread holding it on, with the holes positioned vertically, it would look like cat pupils. Yay. For the curtain rod itself, I found a thin, flat wooden rod at my local fabric & craft store (in the section with the dowels) and cut it to be a couple of inches wider than the window. They’re boning caps, meant to be put on the ends of pieces of boning in a garment to keep it from digging into your skin. But they were a pretty good size to go over my rod. They’re still a bit wider, but they worked anyway. I used hot glue to keep it in place, and then glued big buttons over these so it would look more finished. I threaded the curtains on the rod before gluing those on the ends, though. Lastly I hand-stitched the rod to the page. You can see the detailed shot of the stitches in the picture above this one. Update 1/22/13: Ok, so as was probably inevitable, the wooden piece snapped in half. I finally got around to fix it using materials I probably should have thought to use in the first place. Duh! 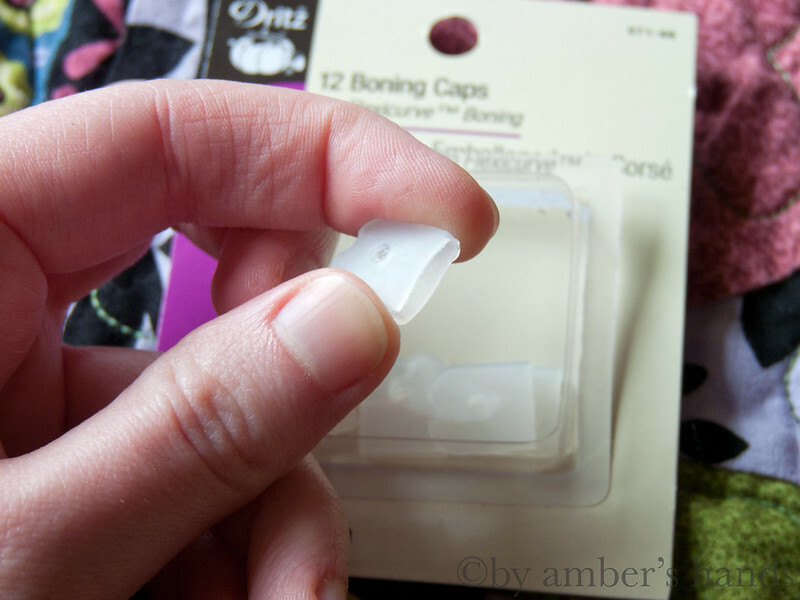 I used boning caps for the ends, so I should have thought to use this flexible boning from the beginning. This is what it looks like. You can also buy it by-the-yard, which I would have done except they were out of the white at the craft store when I was there. I cut a piece to size and used it exactly the same way as I used the wooden piece. Works perfectly! It’s a little wider than the other one, and I apparently sewed it on a little lower, too. But luckily I had enough leeway in the curtain to fit the boning into the slots just fine. Voila! Since it’s flexible, I shouldn’t have any more issues with it. In theory. When toddlers are involved, there are no guarantees. Ok, now onto the squirrel. I found a felt and fur trim in a very similar color, so I went with it. Since I didn’t need much of the fur (faux, of course) and it came in a trim width (about 4″ wide) I could buy a small length and it didn’t cost much. When I first cut the tail out, I cut it out upside down. You wouldn’t think it would matter, but it looked all wrong to have the nap going downward instead of upward. Because of this, we had to (and by “we” I mean “my mom”) piece together 2 scraps to get a big enough area to re-cut it. But you’d never know now. On the squirrel’s body, the arm & front leg are additional pieces cut out and layered on top of the first body outline to give it more dimension. I hand-stitched the eye and nose on with a blanket stitch before ironing it to the page. With hand-stitching, I always find it easiest to sew through the least number of layers possible. Then I ironed the body pieces down and stitched it down by machine. For the tail, I couldn’t use Heat’n Bond, and I couldn’t stitch it by machine. So I pinned it a bit and then pushed the fur from the edge of the backing as much as I could. Then I stitched it about 1/4 of an inch in from the edge, using a running stitch and taking a smaller “bite” out of the fur than the felt page. 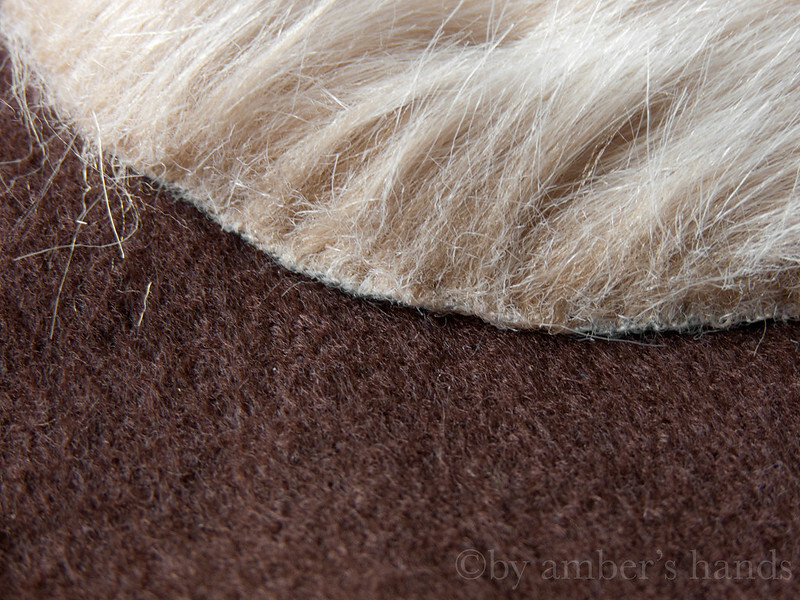 When I pushed the fur back into place, you can’t see the stitching at all. For the acorn, I used the wood-patterned fabric for the back and the lower part of the front. 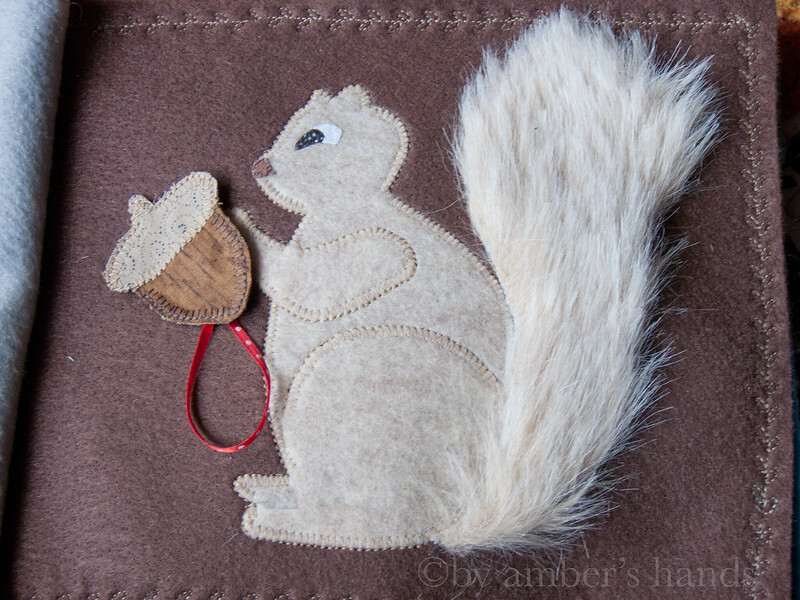 I hand-sewed the snap on the backing piece before ironing & sewing the front of the acorn to the back. That way there were no stitches showing on the front. As you can see, on some of the small, removable pieces I sewed a length of ribbon to keep them from getting lost. I slid the ribbon in and stitched it along with the snap on both sides so I didn’t have to do extra stitching. 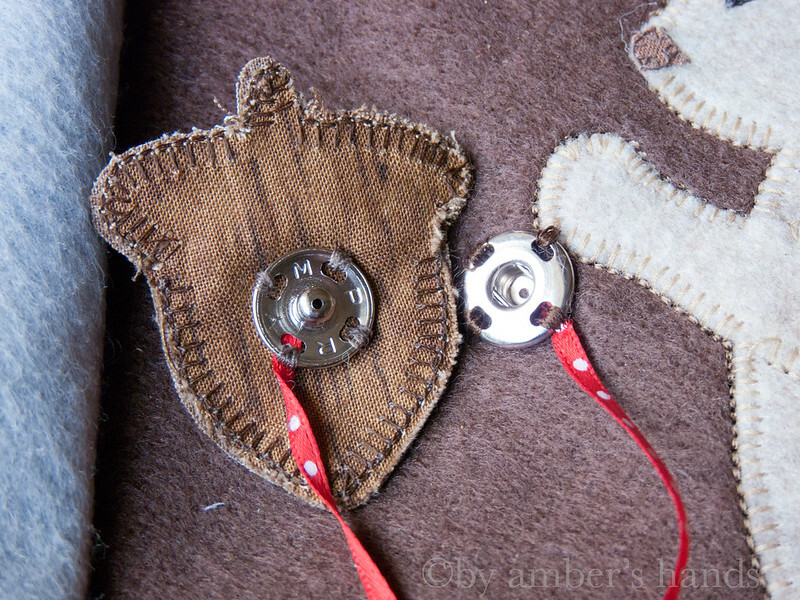 I used the machine to sew the acorn front & back together. It was a little difficult with the snap in the way, but it wasn’t too bad. But since I had to cut out the pieces before stitching them, I couldn’t sew quite as close to the edge as is ideal. Because of this, the edges frayed a little bit, but nothing major. If you’re making one yourself, you could probably prevent this by using some Fray Check on the edges after ironing it together but before sewing it. So that’s the first spread of Little Man’s Busy book. I hope I explained things well enough. If you have any questions, feel free to ask them in the comments and I’ll do my best to answer! I made a busy book for my daughter 30 years ago and am looking for new ideas to make for my granddaughter. I really like your ideas. Aw, thanks! If you have any questions, let me know! Thank you for this tutorial! I have been able to find lots of ideas, but I appreciate how well you explained everything. I am looking into purchasing a sewing machine….just to make a busy book. My husband will be thrilled! Do you still like your Brother sewing machine? I’m glad you find this helpful! I do still love my machine, but I should reiterate I’m just an occasional machine user. 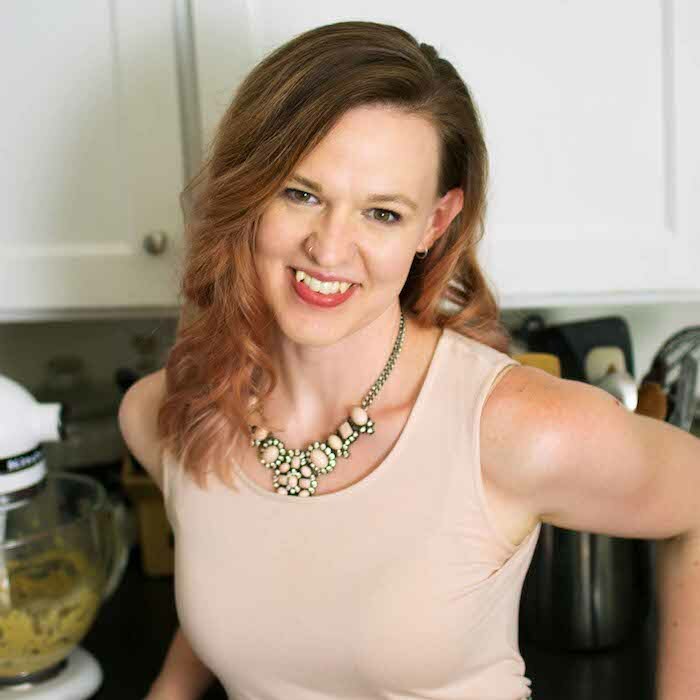 I recently made a couple dresses and it’s been working great, but I only use it maybe once every few months.